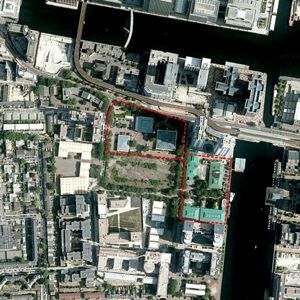 Developer Galliard Homes has submitted plans with Tower Hamlets Council to build a new high rise urban ‘village’ project on a 2.6 hectare site at South Quay in London Docklands. This Millharbour Village project would take five years to build, delivering approximately 1500 new homes, educational uses, two new public spaces, and a new pedestrian road linking Millharbour Village to Marsh Wall and Canary Wharf Station. Six towers will be grouped in two clusters around two new parks – Millharbour Park East and Millharbour Park West – with the tallest building rising to 45 storeys. The developer has appointed architectural practices Studio Egret West and Hawkins Brown to jointly design the large scale urban regeneration project. Galliard Homes said the scheme will make a significant contribution towards the Capital’s housing needs including affordable housing and will complete the transformation of South Quay. It added that its vision is “to create an attractive, spacious and socially inclusive environment in which businesses and families will flourish”. Millharbour Village is one of the last docklands sites to be comprehensively redeveloped under the regeneration process that started in the 1980’s. Studio Egret West said a planning application for Millharbour Village was previously submitted in 2009, but withdrawn due to lack of support by the Local Authority in 2010. It noted that with the subsequent lack of confidence in the London development market easing, the project is now being pushed forward again. London Docklands is expected to be a hive of construction activity in the coming years. Contractor Carillion has already started work on a £90M residential twin tower block scheme in Royal Docks, which is scheduled for completion in Autumn 2016. Meanwhile plans for a 53 storey residential led tower at Meridian Gate on the Isle of Dogs were submitted for planning to Tower Hamlets Council earlier this year.